Dailybuzz.ch: US First Lady, Michelle Obama And Ellen DeGeneres Had A Dance-Off For The History Books! US First Lady, Michelle Obama And Ellen DeGeneres Had A Dance-Off For The History Books! 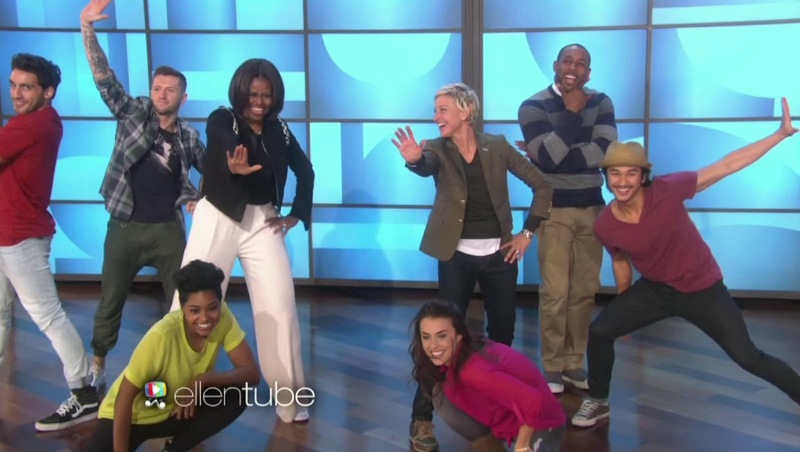 US First Lady Michelle Obama showed off her dance moves during a toe-curling appearance on the Ellen DeGeneres Show. Challenged to show off her dance moves by Ms Degeneres, Mrs Michelle Obama gamely obliged and went on to pull shapes that wouldn't have shamed Rita Ora. Mrs Obama was appearing on the show to mark the fifth anniversary of her 'Let's Move!' initiative, which aims to encourage people to get out and do some exercise. As part of the campaign, the US First Lady revealed that she - and a party of helpers from So You Think You Can Dance - will be performing a routine to Uptown Funk on the front lawn of the White House during the annual Easter Egg Roll. This year's event, which will take place on the 6th April, is part of a tradition that dates back to 1878 when President Rutherford B. Hayes opened the White House gardens to local children. Although egg hunts are no longer part of the event, children are still invited for egg rolling on the lawn and a slap-up afternoon tea. Among the children to attend this year will be the Obama's daughters Sasha, 14, and Malia, 17, who will have a ringside view as their mother struts her stuff. Luckily for the teenagers, Mrs Obama revealed during her chat with Ms DeGeneres that she has been practising for the moment for more than a year, hopefully minimising the potential for embarrassment. Not that the Obamas will be too worried if they are, with President Obama previously telling the Press that should his daughters think of getting a tattoo, he will insist on getting one too. Most recently, the girls couldn't hide their embarrassment during a Thanksgiving event, the pardoning of the turkey, in which Obama 'pardoned' two turkeys named Mac and Cheese. Like his wife, the US President has also deployed dance as a means of winding up his daughters, having once told People magazine of his penchant for performing to Gangnam Style.